Jo Ann Hardesty | 1/23/2019, 6 a.m.
As I start my third week on the Portland City Council, I am concerned about how privilege and, specifically white male privilege, is limiting the public’s access to City Hall. These disruptions create a chilling effect on people who are unaccustomed to coming to our City Hall to have their voices heard. People are afraid to bring their children to our important civic meetings. These disruptions seem to be caused largely by a small group of white men who use their privilege to act disruptive, act disrespectful and act self-centered. This behavior limits access to those entering this building for the very first time or for those who are new to the political process. This is not the spirit of speaking up for civic change that is the heart of activism. I ran my campaign on a platform of creating One Portland. 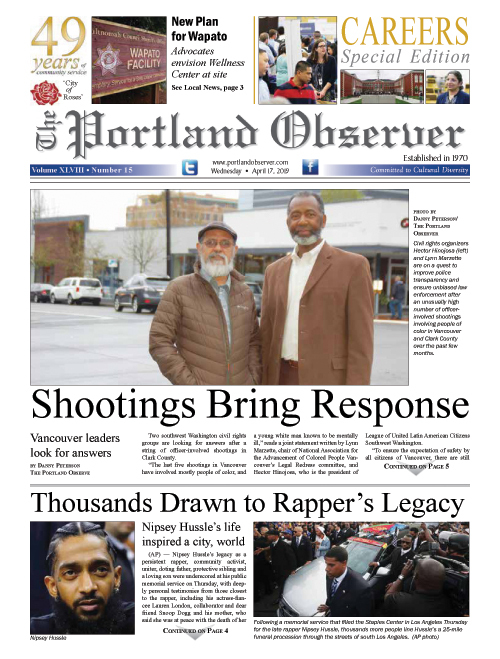 I promised a Portland where regardless of race, income, sexual orientation, or country of origin you will have a respectful interaction and reception when you enter City Hall and from city officials. We fail in our job when we don’t make access equal, accessible, and fair to all who seek a voice in our processes. We live in a state built on white supremacy and the legacies of that history linger on today. Many of the disruptors are people that I know personally and I respect their desire to be heard. I share their concerns and I, too, am passionate about many of the issues that they care about. However, their issues and concerns shouldn’t drown-out the voices of others who come to this building seeking the same access and opportunity. As someone who has spent time a lot of time on the other side of this podium demanding accountability, I find it chilling and disrespectful that there are a few white men who think that everything this council does is about them. It isn’t. I want to engage people from all walks of life in their local government, but I am very concerned about how they will experience their local government if their first, second or third experience at City Council consists of constant disruption. If you have a proposal to improve the outcomes for people in the city of Portland, you will find a welcoming ear and my office is ready to assist you. However, if this is simply about having footage for your YouTube channel or Facebook page, you should be aware that using your privilege in this way cannot continue. You have a right to have your voice heard, but not at the expense of other people. I am encouraging other white men and women to check the behavior of those who seek to drown out the voices of others. Civic discourse cannot thrive if it is not coupled with civility and respect for all others. Jo Ann Hardesty is a Portland City Commissioner.